Having lived in places with mountains and places without mountains, I'd take the mountain town 10 out of 10 times. How could you not, right? With peaceful vibes and serene natural beauty, there's no town so crappy that it can't be enhanced by the presence of giant rocks in the background. But this list isn't about crappy towns. Quite the contrary. It's about exceptional towns that just happen to be located on or around the hills. And while, sure, narrowing down an endless number of mountain towns in a country with myriad mountain ranges was no easy task, we took into account scenery, activities, mountain "feel," and the bar/restaurant scene to determine the 13 spots that clearly tower above the rest. Editor's Note: For the sake of fairness, we included no more than one town per state. Sorry, Colorado. What the Sangre de Cristo Mountains surrounding this New Mexico adventurer's paradise lack in size, they more than make up for in character. And whether fly fishing, mountain biking, horseback riding, hot-air ballooning, river rafting, hot springing, or llama (yes, llama) trekking, a stunning mountain view is almost always in sight. 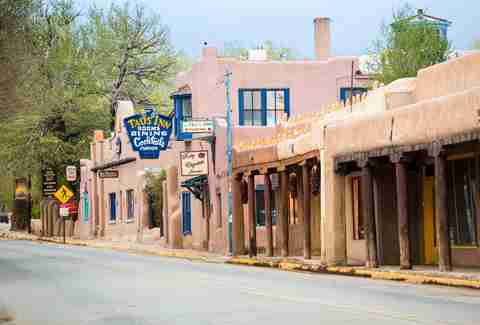 The town itself is an artists colony replete with the adobe-hut charisma of Santa Fe and more than 80 art galleries. Plan to people-watch while sipping margaritas at the happening Adobe Bar at Taos Inn or drink Tecate and play shuffleboard at the oldest house in town, Alley Cantina. Whether you call it "The Halibut-Fishing Capital of the World" or "The Cosmic Hamlet by the Sea," there is no denying the strong pull of this delightful little town on the southern terminus of the Kenai Peninsula's Sterling Highway. 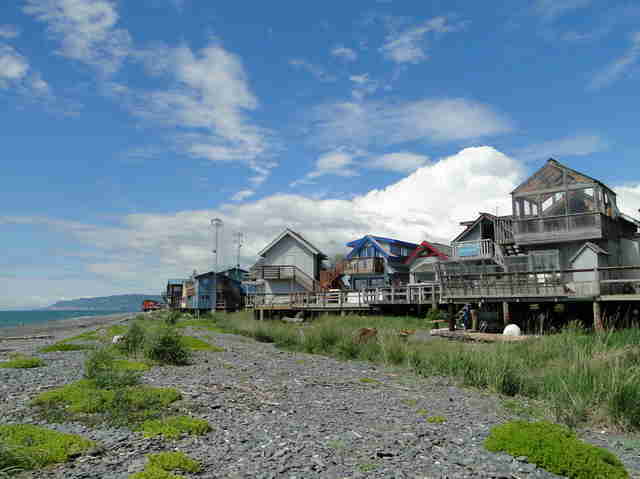 Take in views of the massive Kenai Mountains by boat or plane, or drive out onto the Homer Spit (the world's longest road into ocean waters) to eagle-watch and drink at the iconic Salty Dawg Saloon. A boat ride to Alaska's only state wildlife park, Kachemak Bay State Park, will have you mingling with whales and sea otters or, if you prefer to stick closer to home, explore the funky town's hippie vibes (at places like Ptarmigan Arts) and knock back a few with local fishermen at Homer Brewing Co.
As the site of the 1932 and 1980 Olympics, as well as the annual Lake Placid IRONMAN triathlon, you might think you need to hit the gym before being allowed entry to this peaceful Adirondack town best known for the "Miracle on Ice." 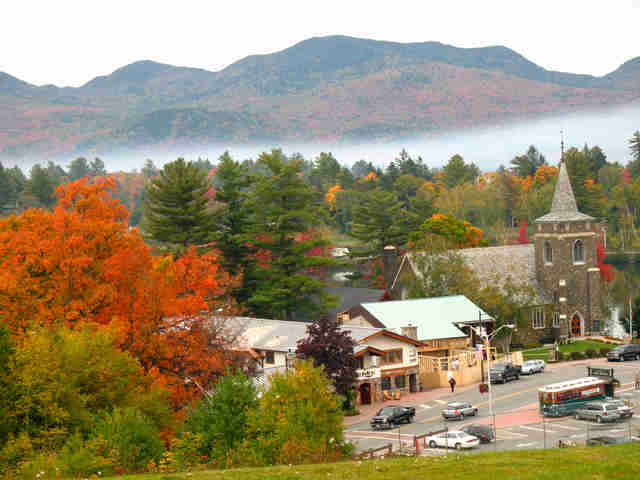 And while you can use the town as a base for adrenaline-junkie activities like climbing the 46 High Peaks of the Adirondacks or bobsledding the Olympic Complex, no one's gonna give you trouble for filling up your growler at Lake Placid Pub & Brewery and walking the trail around Mirror Lake. There's also a gondola ride, scenic railway, and plenty of perches for lakeside drinking and dining like The Cottage at Mirror Lake Inn. The beauty of Telluride stops you dead in your tracks. To stroll through this charming Old West town face-to-face with the massive, snow-capped San Juan peaks rising up from its box canyon location is to know the sheer awe-inspiring power of mountain living. 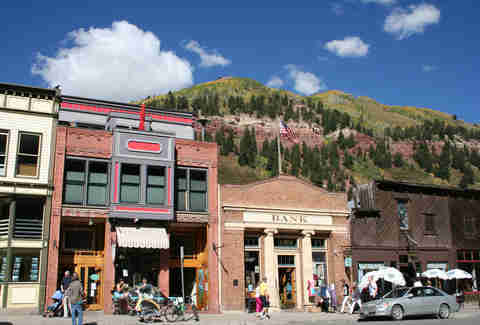 And while there are few better ways to spend a day than exploring the soulful peaks, you don't want to be soulful alll the time -- and worthy distractions include the Last Dollar Saloon and New Sheridan Hotel rooftop. 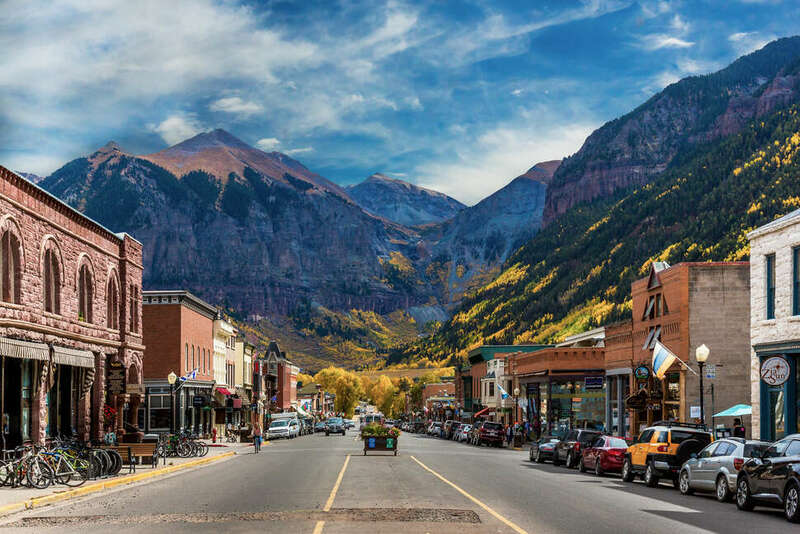 Telluride, which has been named Colorado's best small town, is also famous for hosting a ridiculous number of top-tier music festivals including the Telluride Bluegrass Fest, Telluride Blues & Brews, and The Ride. Don't worry about hiring a designated driver, the public transit here is by gondola. Not only are there gorgeous views of Mount Bachelor to be had from Todd Lake in Deschutes National Forest, but there are also volcanoes, waterfalls, buttes, caves... even rugged badlands ready to be explored. Plus, the Les Schwab Amphitheater is one of the finest outdoor venues in the West. 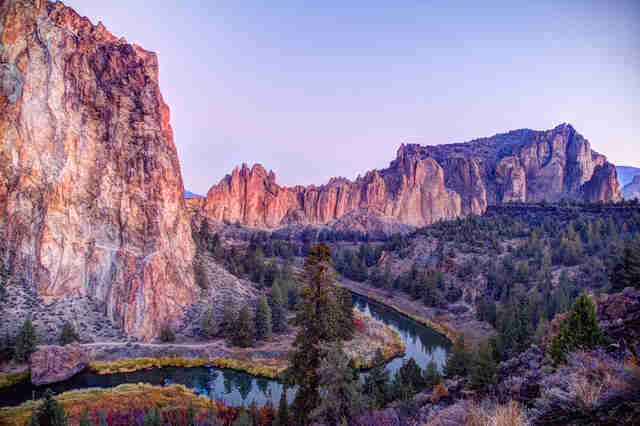 Bend will also be a good time if you’re even remotely interested in craft beer -- it contains so many breweries it’s been affectionately nicknamed Beer Town USA. Start at Deschutes Brewery and work your way through the Bend Ale Trail. If you’re visiting in August, you can also catch Bend Brewfest. 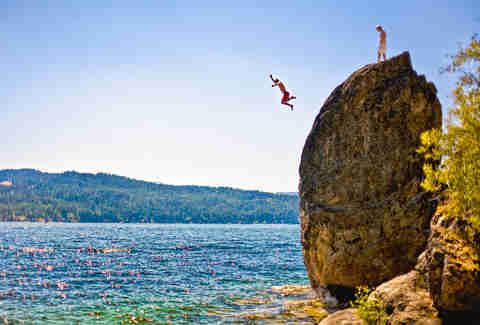 No self-respecting list-maker would omit Lake Tahoe from a compilation of top mountain towns. But instead of the crowded touristy lodges and casinos that steal a bit of South Lake Tahoe's soul, you can keep your chakras clean in the locals-friendly North Lake Tahoe town of Truckee. 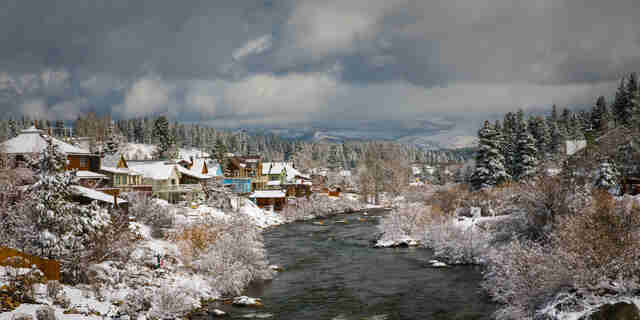 While it's one of the world's premier ski/snowboard destinations, what really makes Truckee a top mountain spot is the lively yet laid-back action in the historic Downtown -- a drink at Moody's, dinner at Morgan's Lobster Shack, or a bite at Jax at the Tracks diner all offer a bird's-eye view into the fine art of clean mountain living. Yes, there's a helluva lot more to do in Idaho than just toss around the football with Napoleon Dynamite's Uncle Rico. Gosh. While some argue that CDA isn't close enough to the hills to be a true mountain town, we disagree. And the deep blue waters of Lake Coeur d'Alene combined with vibrant pine forests, colorful sunsets, lazy beaches, and a charming small-town vibe conspire to make this a perfect mountain/lake getaway. You can also hike the Northern Idaho Centennial Trail, grab a burger (no fries) at the iconic Hudson's Hamburgers, check out the Snake Pit Derby Dames roller girls, or golf one of the world's top courses with a floating green on the 14th hole. Asheville has graduated from the place everyone said was about to be cool to the place that is, indeed, very cool. Over the last few years, this offbeat, freaky arts-centric town has grown into one of America's best drinking cities and, simultaneously, one of its best live-music cities. You know how many breweries Asheville now has within its city limits? 26. Check out a favorite like Asheville Brewing Company or Wicked Weed, then catch a show at the stunning mountain-wrapped Biltmore. Or spend a Tuesday afternoon wandering through a farmers market before heading across the street for live music at the Mothlight. On top of all that, you’ve got trendy farm-to-table restaurants and, of course, the Blue Ridge Mountains. They're right there. 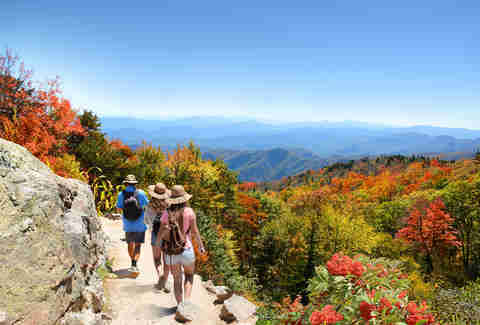 As is the Blue Ridge Parkway, which is basically like hiking in your car. If you’re visiting in the summer, you must go to the Park Silly Sunday Market, arguably one of the best open-air markets in the country. 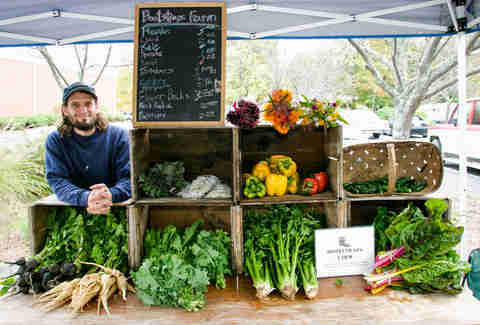 It features local musicians and farmers, it’s eco-friendly, and it’s great for kids. Find your way out of an escape room, and then reward yourself with fried chicken at Handel or biscuits at Fletcher’s (check out Thrillist’s complete guide to what to eat and drink in Park City). In addition to all the mountain-town staples like biking, hiking, river-rafting, and horseback riding, you get the extra-fun activities of Utah Olympic Park -- including one of the longest bobsled rides in the world, and one of only two in the US you can ride. Pull up a chair at one of The Paint Mixer’s 21-and-over classes and try your hand at acrylic-on-canvas painting, which you’re probably bad at, but while drinking, which will make you much better. Lewisburg has a fantastic arts scene, but not the kind that is code for “there’s nothing to do here if you’re not into gallery-hopping and poetry readings.” There is everything to do here. History buffs love the General Lewis Inn, which is sort of part-hotel part-museum. Tour the Lost World Caverns, or go for an early-morning hike and get lunch at the Stardust Cafe. Wind down with a hand-crafted cider at Hawk Knob. Go antiquing (it’s a thing). Lewisburg has not one but two food festivals -- one of which is chocolate-specific -- and a Saturday farmers market during the summer, which is more than you could ask of most towns whose population doesn’t break 4,000. On the first Friday of every month, starting at 5pm you can find food and art vendors plus live music gathered downtown (the event is helpfully called First Fridays After Five). As a bonus, it borders the town of Fairlea, where you can catch a summer concert series in July and the State Fair of West Virginia in August. 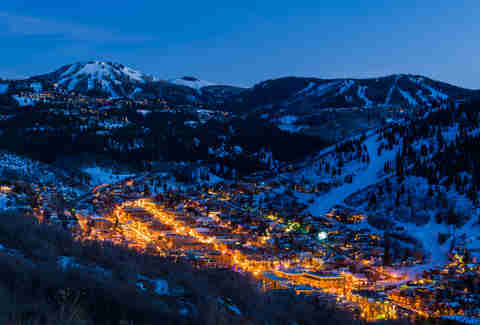 Named for the region’s sugar maple trees, Sugar Hill is the tiniest of tiny towns yet still close to a number of ski resorts. Beloved institutions include the Sugar Hill Sampler Shop (for souvenirs), Harman’s Cheese & Country Store (known for its white Cheddar), and the wildly popular, James Beard Award-winning Polly’s Pancake Parlour, whose level of celebrity normally you associate with towns larger than just a few hundred people. There’s an excellent campground, but if sleeping indoors is more your thing you’ll find delightful rooms at The Inn at Sunset Hill. Not to be confused with Sugar Hill Inn, a B&B you’ll find charming, too. 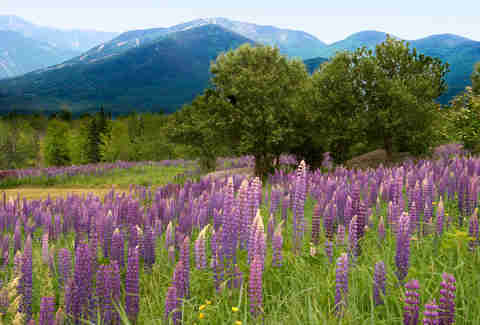 In the summer, Sugar Hill’s blossoming lupine flowers are so breathtaking they merit their own festival, which draws visitors from all over New England. Wind down with dinner and a drink at Bailiwicks. For the best view of Woodstock itself, make the short hike to the summit of Mount Tom. 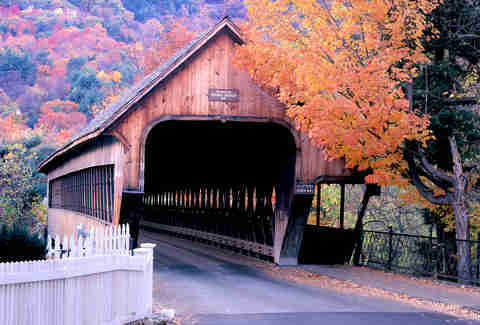 The town is great for both skiing and snowshoeing, but you can also enjoy some less-challenging, quintessential small-town-New-England features like a very photogenic covered bridge and the must-see Billings Farm & Museum, once owned by Rockefellers. It hosts all manner of events year-round, but in October you can catch the traditional Harvest Weekend, whose advertised activities include: a husking bee, a barn dance, cider pressing, root-vegetable harvesting, plus, of course, cider and donuts. Watch mesmerizing glass-blowers, visit a farmers market that takes giving back to its community seriously, and unwind with a craft beer at Worthy Kitchen. Mountain Creamery serves way more than just ice cream, but it is a very solid bet indeed for ice cream. For a lake you can swim in confident that you’ll be safe from snapping turtles or leeches or whatever, hit up the nearby Silver Lake. With historic Victorian architecture and winding streets, you'd be hard-pressed to find a town as distinct as this little Ozark gem, which has been named the best small town in the state. The entire city is listed on the National Register of Historic Places, which means you can consider your burger and Bloody Marys at the Balcony Bar or your green-screen karaoke disaster at Eureka Live Underground a lesson in history. And when you're done "learning" and are ready to explore, there's zip-lining, cave tours, boat excursions on the lake, and postcard-perfect foliage in the fall. 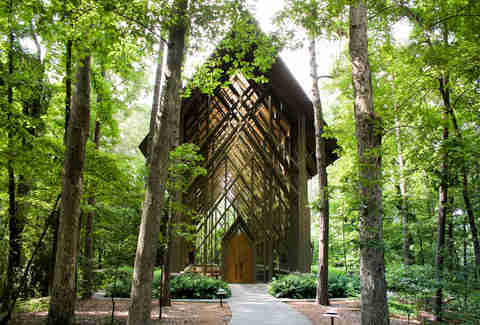 Just don't pass up a trip to the nearby Thorncrown Chapel, a jaw-droppingly beautiful glass chapel in the woods. Jay Gentile is a Thrillist contributor and he prefers hiking in his car whenever possible. Follow him: @innerviewmag. Kastalia Medrano is Thrillist's Travel Writer.